Are you frustrated with your characters? Are they slowing down what should be a gripping, page-turning story? Maybe it’s time you got them off their rear ends and put them to work. In my re-writes, I search the text for characters who THINK rather than ACT. When I spot a cerebral, lackluster character, I start re-staging the scene like a director, deciding how the characters should approach and look at one another. When I’ve done my job, every character will be in motion. His tone of voice, eye movements, expressions, and stance will reflect and amplify his emotions and attitudes. THEN each character can tell a compelling story. Body language is one of the most powerful tools a writer can use. When we express our characters’ emotions and thoughts in concrete, physical terms, we pull the reader deeper into the story. I once saw her chew out an Air Force major. I was in the next room, and could hear nothing, but could see them clearly through a window. Joni, a short brunette with the face of a child, was enraged, jabbing her finger and thrusting her tiny chin at the major, her blue eyes blazing in fury. The major took it like a confused, whipped puppy. In the dark, drunks with slouching shoulders gave way to grim-faced men with dead eyes and scarred forearms. I found myself being swept along with the drunks. The lone bench in the back was filled with Cuernavaca’s meanest residents, and I didn’t feel like another fight. I leaned against the unyielding bars and shut my eyes. The pressure of the cold metal against my throbbing head and back barely registered. There was no fight left in me, no strength. I had no idea of the time or what I could do next. Hazy minutes passed by while I propped myself up against the bars. There was no clock. I guessed I’d been in the hole at least two hours. My eyes burned when I shut them. The reason body language is so evocative is because we are social beings. Long before the invention of language, our physical reactions communicated to others vital information about what we were experiencing. Facial expressions, gestures, and posture came long before the invention of language. The ability to “read” body language is more fundamental, and therefore more moving, than reading written language. So the more physical we can make the story, the more real it is to the reader. That’s why other researchers have found that the brains of those who read powerful stories are changed by those stories. Indeed, reading vivid stories actually creates “muscle memory” in the brain as if the reader had actually lived the events in the story. No wonder my feet hurt after reading Tolkien’s The Fellowship of the Ring. That was quite a trek. Psychology Today offers a useful introduction to body language. If you want to rev up your stories, learn the basics of body language and, like a stage director, guide your characters’ movements so they reinforce what your characters feel and think. Love the connections to science here – really enjoyed this, a lot to think about and remember – very useful, thank you! I appreciate the kind words. I’ve always been a science geek, in addition to all my other interests. So many things to love, so little time! I try to link only to the good stuff! Brilliant. Found myself engrossed in every line. Thank you! I’ll keep posting articles I’ve found helpful and inspirational. It’s true in fiction, too. Hahaha. Flannery O’Connor is witty and on-point as usual. Thinking, writing, and reading — all one muscle group sharing the mutual benefits of cross-training! Glad you enjoyed it. Thank you for stopping by. I’ve read renowned expert Alan Pease’s books on body language and have learnt quite a bit on reading the imperceptible messages a body can convey. Thanks for the tips on emphasising action to give a character depth and make them more interesting. His intro is essential. Easy to understand, and practical. You captured me with the Toshiro Mifune photo, a great lede. I see it came from Yojimbo, one of many fabulous collaborations between this actor and Akira Kurosawa, the unmatched film director. 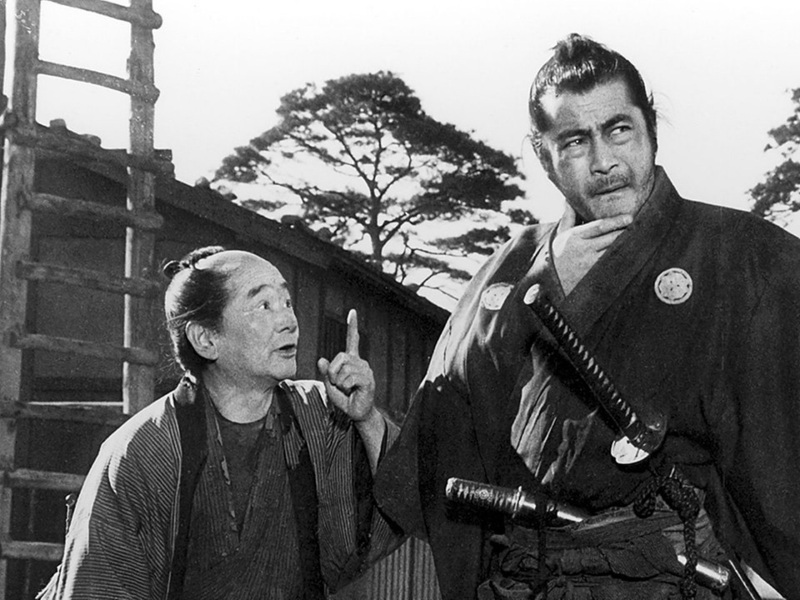 So apropos for your topic, Mifune’s ACTIONS sold Kurosawa’s stories to audiences that could never guess the enormous stage presence was generated by an actor just 5 feet 9 inches tall. Like a good on-screen story, this post had me clinging to every word with its brilliant wisdom. Well done! I’ve long been a fan of Kurosawa. And did you catch Mifune’s performance with Charles Bronson in Red Sun? Wow. What are the characters Doing while they’re walking, talking, and standing around?? This is something that many people forget – great information, here! It really is. Many people forget to put in the little details, like someone grimacing in pain or cutting their eyes sideways…little things that an astute person would notice! This is why animations have gotten so much better – much is said in a facial expression, even when no words are spoken. There we go, a real case for the sensory details I’ve encouraged among writers. Thank you. I’m honored by your kind comment.